Hanhart has just completed production of this 150 piece limited edition watch and we were fortunate to receive the entire remaining collection which is now in stock. Once these watches sell out no more will be available, so don’t miss your chance to own a stunning new design from Hanhart which captures both the brand’s history and excellence in watchmaking in a three handed (non-chronograph) design. 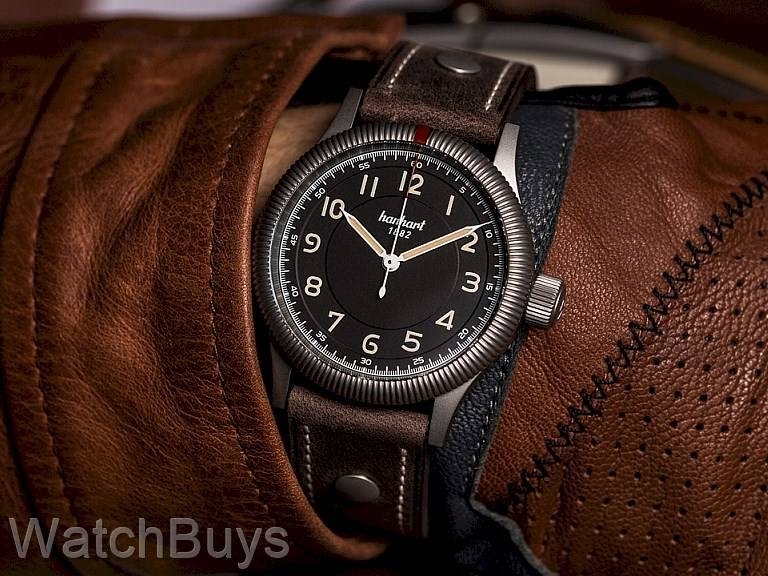 This watch has quickly become one of the best selling watches in the company’s history - announcing a new three handed watch from Hanhart - the Hanhart Pioneer One Limited Edition. Hanhart is known for their chronographs and mechanical timers, but until now did not offer a non-chronograph watch in the "traditional Hanhart style". We began discussing with Hanhart our desire to produce a three handed watch in the classic Hanhart style almost three years ago, and we specified that this watch should have the traditional Hanhart fluted bezel and other design cues from their Pioneer Series. 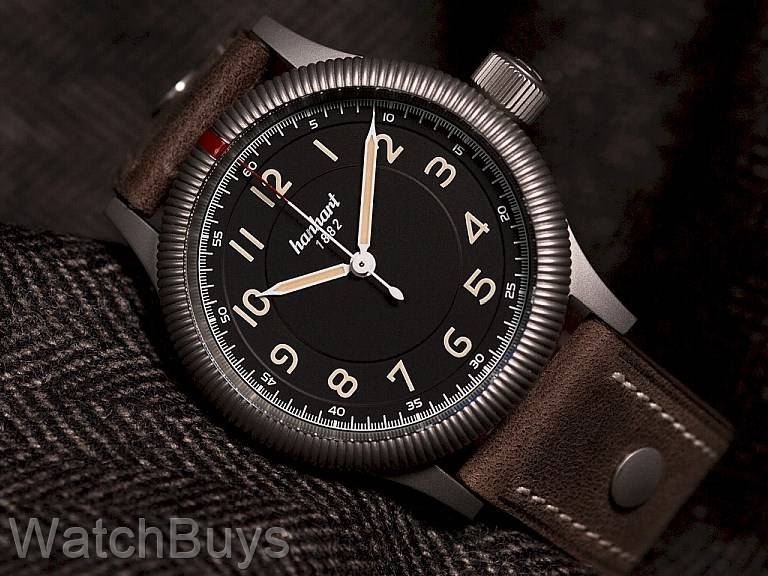 The designers and watchmakers at Hanhart went to work spending quite a bit of time in their own museum reviewing earlier and now iconic Hanhart watch designs from the 1940’s and 50’s. Their work paid off and this watch is a true showpiece for the brand. The Hanhart Pioneer One offers a healthy dose of Hanhart history with a contemporary case size and other important design elements. For example, in choosing the hands, we revisited Hanhart's 417 ES flyback chronograph series from the 1950's. Hodinkee has written an excellent article about that watch and the famous actor who wore it while biking. And if you are really interested in Hanhart timepieces from this period, be sure to read this article and view the similarities to the design of this new watch. 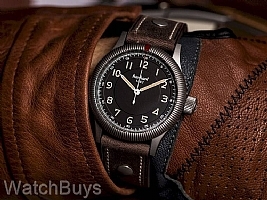 The large crown was also important in early Hanhart designs, allowing the pilot to use the crown while wearing gloves, and that crown is fitted on this watch. What was also very important in the development of this watch was the highly bead blasted stainless steel case, which in certain light takes on an almost gray gun metal finish. Visitors to our Road Shows in Orange County and New York were treated to viewing this watch in person, and the case finish, coin bezel and matte black dial all received high marks. A note about the case - we worked hard to make it appropriate for almost all wrist sizes. Although the case diameter is 42 mm, we shortened the lug to lug distance to only 49.5 mm, appropriate for almost all wrist sizes. Other Hanhart watches have used and continue to use 42 mm cases, but only on the Hanhart Pioneer One Limited Edition is this case size matched with shorter lugs which articulate down to maximize wearing comfort, even on smaller wrists. This case design and the subsequent revisions that we made when developing the prototypes resulted in a more expensive production and more labor hours to construct, but the end result is a case unique among all watches in the Hanhart Collection. Because of our long-term history and interest in this project, we were fortunate that Hanhart allocated almost the entire collection of 150 pieces to us as sponsors of this project. This model is in stock now, but please remember that once they sell out this series will not be repeated or extended as it is strictly limited. We are very proud that what started out as a conversation at dinner in Germany three years ago turned out to be a true classic. Verified Owner Comments: Agree with all the earlier comments (except I had no problems winding it...). I really appreciate the hands not being polished - I have other watches with dark dials and polished hands (especially seconds) and they often disappear, not so here as the hands are either bead blasted or painted, hard to tell. The strap was quite stiff on first wear but it changed its shape in just a few hours of wear. For those that care, yes, the movement inside would seem to be one that had a date, probably removed the date wheel - there's no date window but the crown has the phantom position where you would adjust the date. This does not bother me. I appreciate a workhorse movement (Selita SW200 if the reviews are right) for future service considerations. Legibility is fantastic, like the no-date. Does not feel like 12mm thick. Crown is large but not too large (for me). Really like the rotating bezel - in concept and in action. Verified Owner Comments: Upon receipt of my watch I discovered that it couldn’t wind manually. I followed my warranty card and sent it back. Within a month I had my watch back running beautifully at no extra charge to me. The watch is handsome due to its quality and simplicity. My only complaint is the strap is a little too short even for my small diameter wrist. I wouldn’t even change the design or style of its strap. 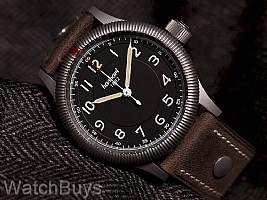 "Hanhart Pioneer One Limited Edition"
Verified Owner Comments: This watch is excellent. Great finish and attention to detail. Running +/-2 Seconds per day. I received a call after placing my order to tell me what to expect and answer any questions I might have before receiving the watch. Nice touch! Impressive seller. Verified Owner Comments: The Hanhart Limited edition Pioneer One fills almost all the boxes for what I need in a timepiece: Size, style, general effect, legibility , luminosity and reliability. Adding a few extras like a solid strap, a beautiful coin edge bezel, a functional minute timer, the iconic red bloop, great finish and case metal, NO DATE, and a bit of provenance make this a wristwatch I wear often, receive more than a few compliments on and feel good to have in my collection. A pair of recent younger siblings rounds out a trio with some historical perspective, but the limted edition really calls back to a more refined time where functionality met style. Verified Owner Comments: I love the bi-directional friction bezel on this watch. The coin edge for grip and a single red ceramic marker. Simple and gets the job done. I love the choice of font for the Arabic numerals. Very pleasing to the eye. I also like that 5th of a second markers were added to the dial. Without it the dial would have looked to sterile.